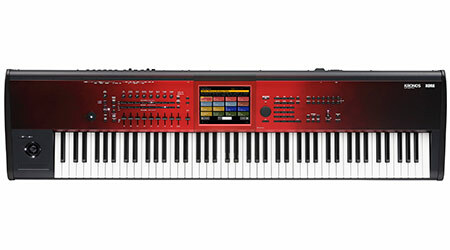 The Korg KRONOS 2 88 special edition is only available in limited numbers and comes boosted with extra sounds and a new look. The stunning Red faded top panel sets off this SE model on stage or in the studio. It also boasts a brand new piano, and a selection of KA Pro sounds all built-in on top of the 9 different sound engines that come as standard. With powerful recording tools and a large touch screen interface, this special edition KRONOS 2 88 opens up new doors in your musical creativity. The Special Edition KRONOS 2 comes with a unique sound set boosted by a stunning new grand piano and a selection of quality sounds from KA Pro. 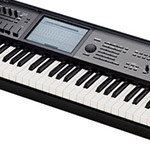 KA Pro produce top class sounds and have put together a showcase of their favourite selections and Korg have installed them in to the SE models. Hollywood style sound through to ethnic and EDM selections, rich strings, brass and more are all added. The new Italian piano offers a beautiful detail and presence quite different to the other pianos found in Kronos. A full concert grand previously used in international competitions was specially adjusted and sampled for the KRONOS 2 SE. Only the Special edition KRONOS 2 comes with the rather stunning red-black fade front metal panel. It really stands out from previous models and even has dark wood sides to compliment the look. A complete set of recording and production tools come as standard; There is a 16 track MIDI sequencer combined with a 16 track Audio sequencer so you can lay down tracks from in-built instruments and even external mics, guitars, keys and any other external instrument you wish to record. A full suite of editing tools is on-board for copying, pasting, and all essential tools down to in-depth individual note and parameter editing. Effects are a key element to high quality sound. The KRONOS 2 is equipped with up to 12 insert effects, 2 master and 2 total effects which can be assigned in virtually any way you need. There are 783 preset effects to choose from so there is plenty of choice! In Combi and sequencer mode the 12IFX blocks can be used as effects on any one of the 16 parts or they can be linked together to form chains of effects for different parts. The tracks can then go to the master effects and total effects for adding reverb and other mastering effects such as compression. With so many effects and paths available you can let your imagination run wild!